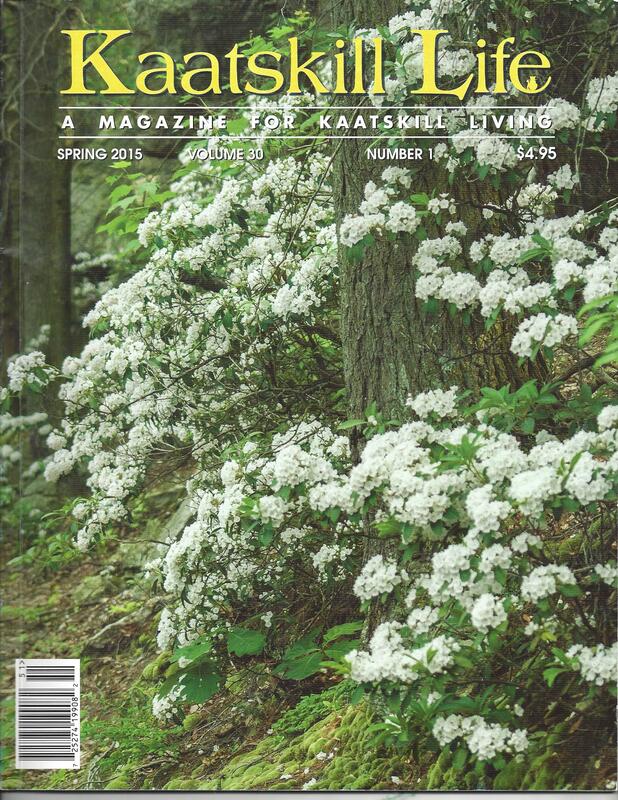 Check-out Our latest Press Releases. 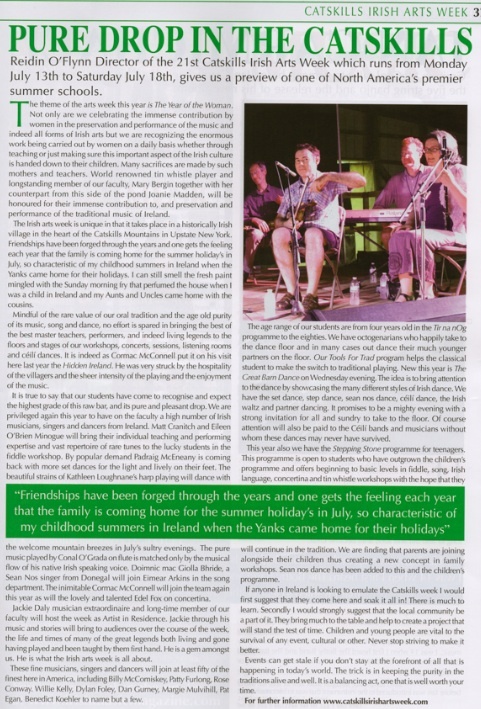 The Catskills Irish Arts Week, in East Durham, NY, presented by The MJ Quill Irish Cultural and Sports Centre, will celebrate its 21st anniversary this July. This charming village will echo the strains of Irish music, song, dance and story, mingled with the lively banter so characteristic of all such Irish gatherings. 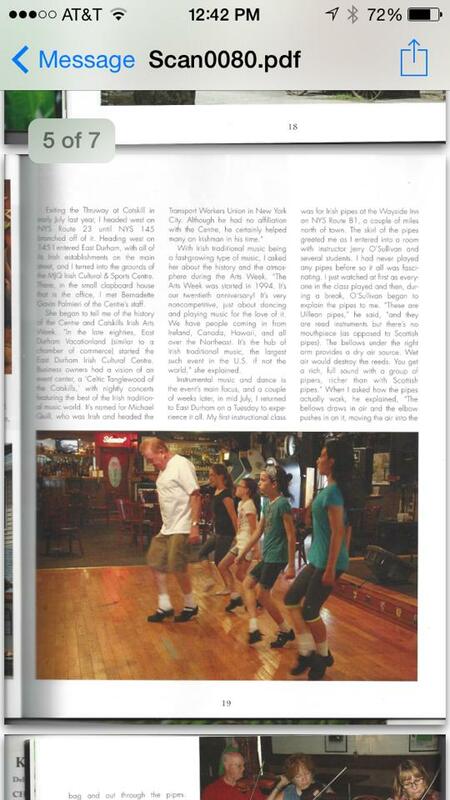 Set in the scenic Catskill Mountains of Greene County, New York just two hours north of New York city, East Durham is no stranger to these festivities as it has been home to the Irish since the early 1900’s. Well–known Irish writer, Cormac MacConnell, was struck by the warm hospitality, so unique to Ireland, when he joined the festival there last July. He called it the “Hidden Ireland”. This hospitality awaits the Catskills Irish Arts Week family of teachers, students, fans and visitors again this coming July. A wonderful week is in the works with old favorites and exciting new surprises. This year, The Year of the Woman, will celebrate all women in the Irish Arts with a special tribute to Mary Bergin and Joanie Madden for their immense contribution to the traditional music of Ireland. Each will delight with a special concert in her honor supported by masterful musicians, singers and dancers. New this year, Wednesday afternoon will be a time to gather your breath and relax in each other’s company. In place of the concert that evening, there will be an old time Barn Dance, complete with a delicious spread of barbecued pig, chicken, and other tasty treats. This promises to be a fun evening of music, dance and craic with friends, new and old. As always, the organisers are honored to be joined by many master teachers from Ireland, America and Canada. Dolores Keane and Kathleen Loughnane will join such notables as Jackie Daly, Matt Cranitch, Dylan Foley, Edel Fox and Joey Abarta, to name but a few, all of whom the organisers are privileged to have on board. 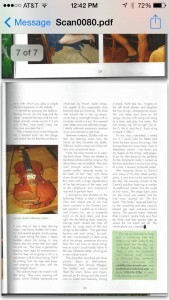 The Tír na nÓg Children’s program, for ages five to nine, has grown from strength–to–strength. This has led to the new Stepping Stone Program. Stepping Stone, originally designed for the youth, has now evolved to include family members exploring the traditions together. Sean–Nós Dance has been added to these workshops. Registration for all workshops is now open online and by phone at 518-634-2286. 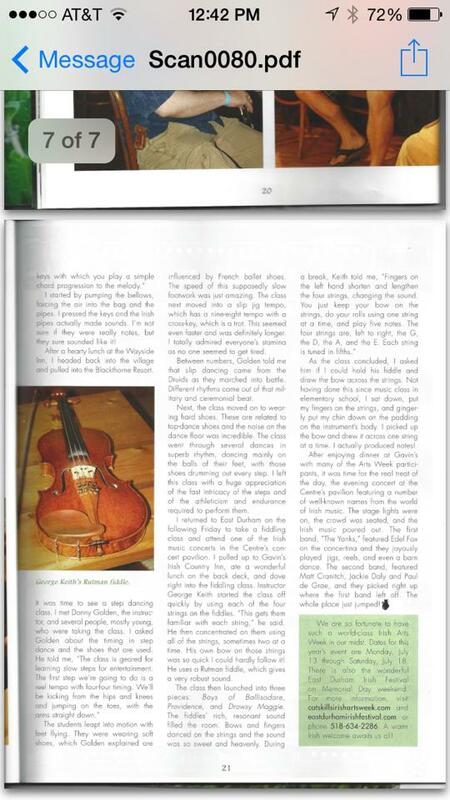 Non–student packages to concerts, céilí dances, lectures and sessions are also available. 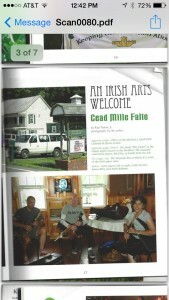 Photo from Catskills Irish Arts Week’s Facebook page. 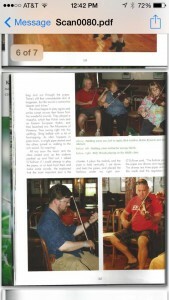 The Catskills have been a favorite haunt and cultural crucible for wandering Irish folk for well over a hundred years. The Michael J. Quill Center — christened for the indomitable Mike Quill, who took on the British occupiers back home in his youth and led New York City transit workers out on strike in the 1960s — has been giving this freethinking centuries-old style of bliss a home in East Durham since 1987. This week, you’re invited to join in the joy, as the Catskill Irish Arts Festival draws world-class talent together for a week of teaching, learning and lots and lots of music. Bretholz has been helping make the festival happen since it began 19 years ago. Workshops in Celtic music, song, dance, and crafts like jewelry casting, sculpture and plein air oils began on Monday, July 15, and are going on all through the week, with instruction for anyone from the rawest beginner to the veteran performer. There’s a Tír na nÓg (Country of Youth) immersion program with divisions for kids and teens. Each day begins with yoga before class; after class come the lectures, jam sessions, concerts at the pavilion, and ceili dances in Shamrock Hall, and the public’s welcome to come join the students and instructors for all that fun extracurricular stuff. On Saturday, July 20 is the grand finale of this Irish village that’s been gathered by choice in the Catskills all week: The Andy McGann Festival, seven ecstatic hours of music, dance and storytelling. A “rare feast of music and song,” is how CIAF organizers describe just one set, that of Séamus Begley & Oisín Mac Diarmada, a singer/accordion player from Dingo and a fiddler from Sligo, who will be joined by a pile of friends. Then there will be NicGaviskey, two Irish sisters and two young men from this side of the pond, who will woo and win you with uilleann pipes, flute, accordion, concertina, fiddle, and flying feet. Come and hear Mary Bergin, the woman the Irish Times has called “just about the best tin whistle player this century.” And those are just a few sets from a long lineup on two stages of the finest Irish wildness you’ll find anywhere. East Durham’s festivities have made themselves a fine name in the lively world of Irish culture: “The biggest assembly of traditional Irish musicians and dancers performing in North America,” according to the Irish Emigrant Online a couple of years ago. All are invited to join in for the sessions, concerts and dancing; see the Irish Arts Week website for a full schedule, details and directions. 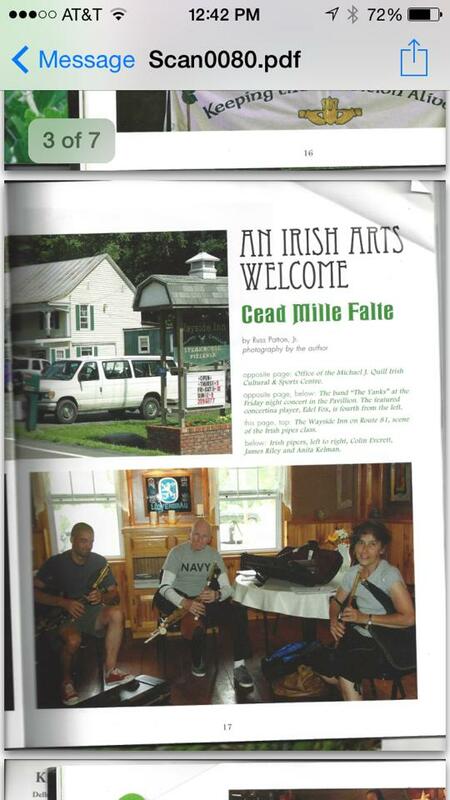 Catskills Irish Arts Week, July 13-19, 2014, Michael J. Quill Irish Cultural and Sports Center, 2267 Route 145, East Durham. Concerts and sessions at multiple venues around town. 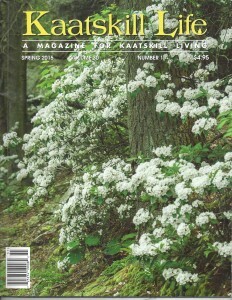 For a complete schedule, see catskillsirishartsweek.com.